I’m happy to say that my baby is back to his normal, happy self after his ear infections. One of my favorite parts of the day is walking into his room in the morning after he wakes up and seeing the huge smile he gets on his face when he sees me. He smiles so big it makes his whole body wiggle with excitement. I wish I was always that happy to face the day. Thanks everyone who sent well wishes and tips for getting him to take his medicine on the last post. By the last few doses, it was a considerably smoother process with less tears and more medicine swallowed. Squirting it in his cheek real quick and gently massaging his throat to make him swallow was what worked for us. I love rhubarb season and each year look forward to baking something with it. 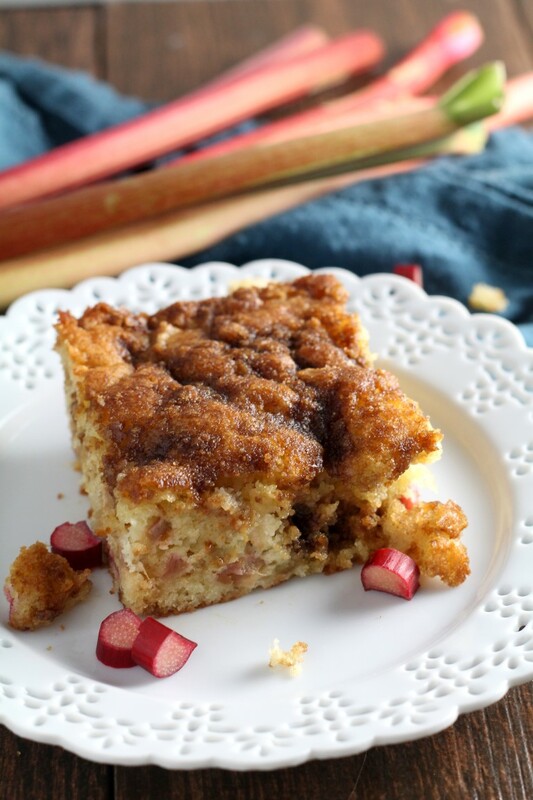 One of the most popular recipes on my blog is these rhubarb bars. It was one of the first recipes I published and remains popular, especially with my Canadian friends. This year, I almost missed the season with all the June craziness, between work, sick babies and weekends packed with plans. Today was a laid back day in the office and I was able to come home an hour early and of course that was the perfect excuse to do a little baking. 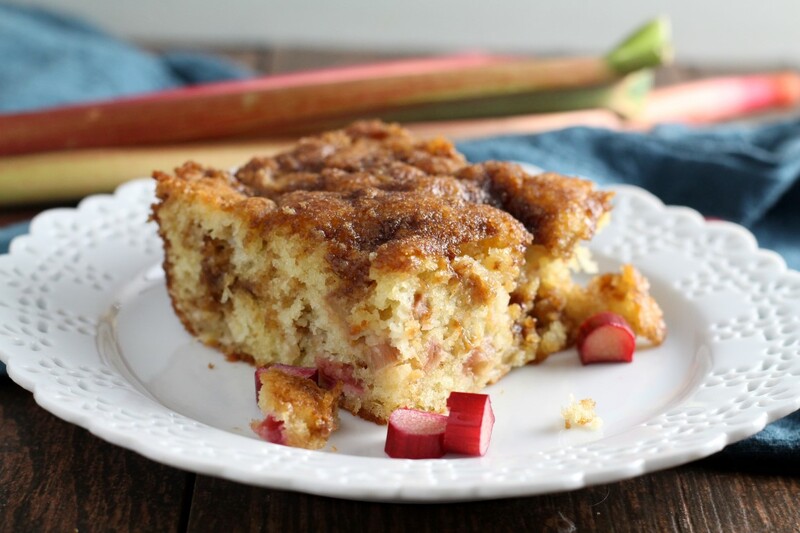 This Rhubarb Coffee Cake is simple and is easily made in less than an hour. Preheat the oven to 350 F. Grease a 9 x 13 inch baking pan and set aside. Cream together the butter and sugar in a large bowl until fluffy. Beat in the eggs and vanilla. Stir in the Greek yogurt. In a separate bowl, whisk together the flour and baking soda. Gently stir the flour into the wet ingredients, just until combined. Mix in 2/3 of the diced rhubarb. 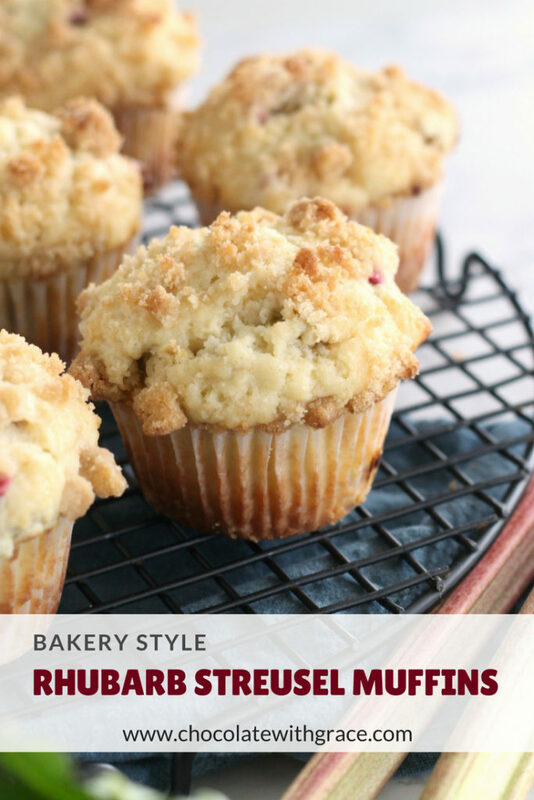 To make the crumb topping, stir together the brown sugar, flour and cinnamon. Cut in the cold butter with a pastry blender. Spread half of the batter in the greased 9 x 13 pan. Sprinkle with half of the crumb mixture and the remaining rhubarb. Top with the other half of the batter and sprinkle on the second half of the crumb topping. Bake at 350 F for 30-32 minutes or until a toothpick inserted in the batter just barely comes clean. Serve slightly warm or at room temperature. 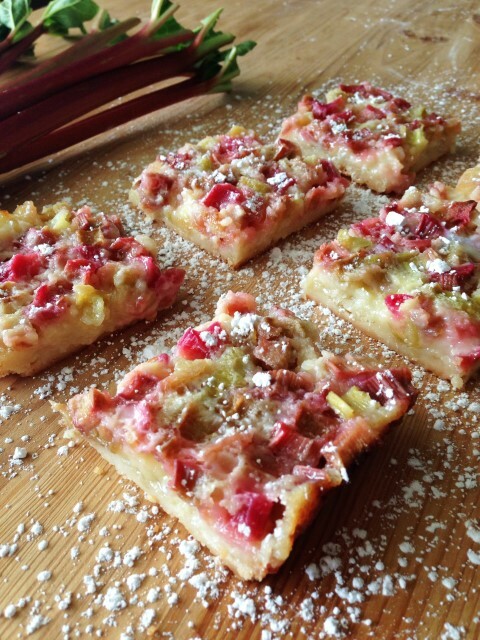 Some other fun rhubarb recipes. This cake looks so moist and delicious and double crumb? Sign me up! Great recipe. I use a greek yogurt. The batter pours more easily if the yorgurt is warmed to room temperature. Looks amazing. Do you think it would be ok to use frozen rhubarb? I think so, I haven’t tried it though. I would just be sure to strain off any excess liquid. 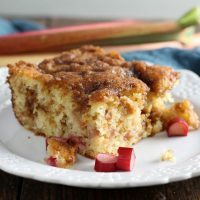 We finally have a bumper crop of rhubarb again – so I have been scouring for new recipes to use some of it up and came across this. Made it this afternoon – still cooling at the moment – but if it tastes as good as it smells I may have found a new way to bake with it lol. I was going to just cut the recipe in half, empty nesters don’t need a big cake in the house (neither does my waistline for that matter lol) but I did the full batch and will take some to my mom who’s living in a senior retirement home now. She’s always loved anything with rhubarb so she will be smiling when she sees this! Thanks for a great recipe! Just a little update – this cake is delicious! I sent about 8 pieces with my hubby to work and he said that within an hour there was nothing left – and he had 3 pieces before sharing which is amazing because he’s not a lover of sweets as a rule lol. Then I brought mom about a half dozen pieces and she couldn’t stop moaning in pleasure with each bite so I would call this a HUGE success! The cake itself is very moist, not crumbly at all and holds up very well even after a couple days. Think I might even try this with other fresh fruit as the summer goes on….thinking peaches maybe from our own peach trees in the garden! I was taught to peel the rhubarb, this is never mentioned in recipes. Just curious, is this something you do? Maybe I am doing an unnecessary step? I’ve never peeled it, or anyone in my family that I know of.